Tapas, the popular Spanish snacks or appetizers, come in many forms. Often simple, occasionally complicated, served both hot and cold, over the centuries tapas have evolved into an integral part of Spain’s sophisticated cuisine and culture. Tapas are frequently strongly seasoned with such ingredients as garlic, chili pepper and good Spanish olive oil. Patatas Bravas, meaning “bold or ferocious potatoes,” is just such a dish. The name may not refer to the potatoes themselves, but to the fact that it takes a brave person to eat them! The dish is said to have originated in Madrid, where it’s served with a spicy tomato sauce seasoned generously with cayenne and other chilis. This is the version that you might find most often on an American Tapas menu. But there are many intriguing regional variations of Patatas Bravas that differ significantly in their ingredients and method of preparation. In Catalonia and Valencia, Patatas Bravas are made a bit differently, and it’s from this version that our recipe takes its inspiration. Boldly flavored with hot chili, garlic and smoked paprika, laced with generous splashes of good Spanish olive oil and sherry vinegar, this dish is a bit different from the usual fare, something deep, complex and adventurous. If the slow, steady burn of fiery chili peppers is not your thing, never fear. You can make this deliciously savory dish as mild or hot as you like. 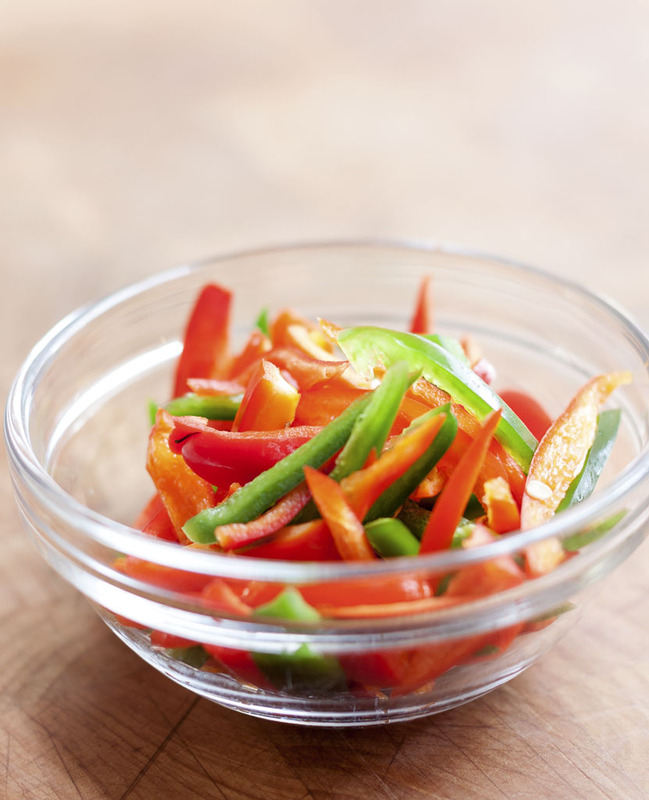 Use mild & modest chili powder and sweet baby bell peppers and you’ll end up with a satisfyingly tasty treat that even a timid palate will love. But if you like it HOT, lay on the chilis and crank up the heat! A good pinch (or three) of cayenne and some incendiary fresh chili peppers (perhaps even habanero?) will bring sweat to the brow of the boldest, bravest man. Viva Patatas Bravas! 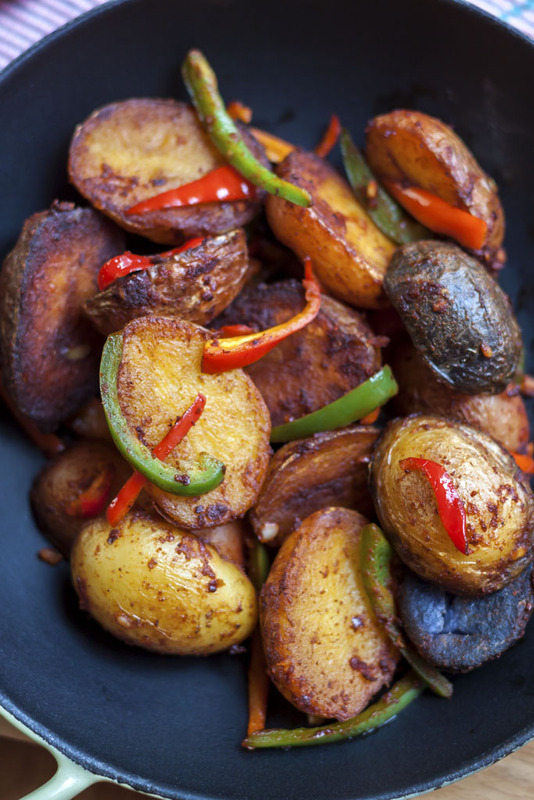 Dried chili peppers have a deep and complex intensity that imparts a smoky richness to the crisp, pan-fried potatoes. 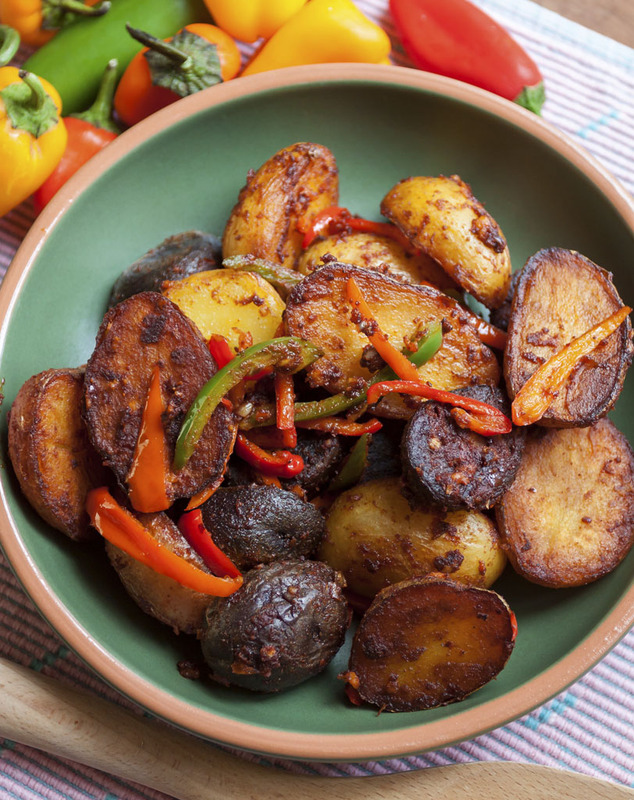 The addition of bright, tangy Spanish sherry vinegar heightens and accents the sweet creamy flavor of the potatoes. Scrub the potatoes well and put them into a large pot of salted water. Bring to a rolling boil, then reduce heat slightly and cook for 10 to 12 minutes, or until just tender enough to pierce with a knife. Drain and allow to rest until cool enough to handle. Peel or don’t peel, as you prefer (we didn’t peel), then cut into halves or large chunks. Heat the olive oil to medium high in a large, heavy frying pan. Add the potatoes and fry them, turning frequently, until the edges are crisp, crusty and golden brown. 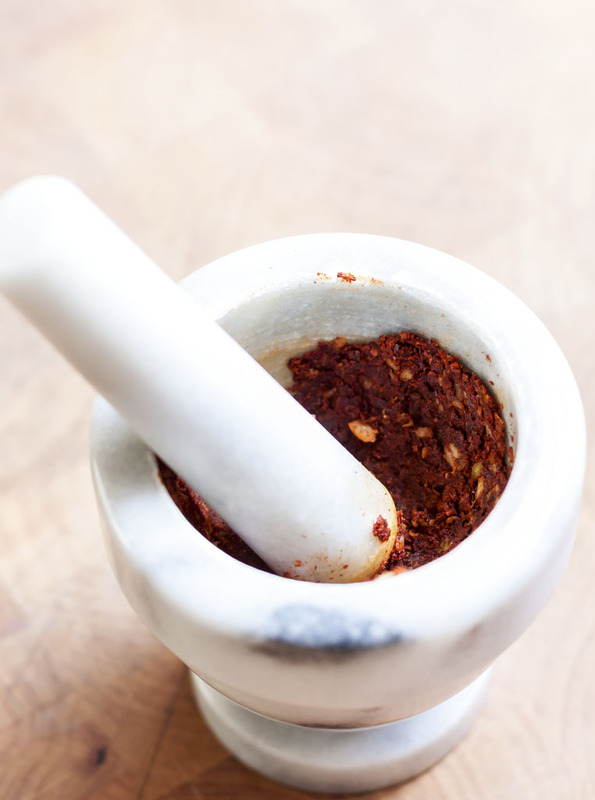 While the potatoes are cooking, smash the minced garlic, chili powder, smoked paprika and cumin together with a mortar & pestle. If you don’t have one, mix everything together in a bowl with a fork, pressing hard to mash it into a coarse paste. Stir in the sherry vinegar, then scrape the mixture directly into the frying potatoes. Stir to coat the potatoes completely, then add the sliced peppers and continue to cook for 2 or 3 minutes longer. Sprinkle with a little coarse sea salt, and serve either hot or at room temperature as tapas-style appetizer or side dish. These look so darn tasty! Love that crispy skin and creamy inside… and all those spices! Come to mama!